BSMG IS A NATIONALLY RECOGNIZED BGA AND AS SUCH UPHOLDS HIGH ETHICAL STANDARDS. What Is A Policy Review? Policy is performing as originally designed and is still on track to meet the financial and protection needs of your client. Remains suitable to your client’s current financial situation. Policy has the most competitive pricing and underwriting assessment currently available. Why Introduce a Life Insurance Policy Review? Current interest crediting rates are significantly lower than the rates proposed/illustrated when the policy was originally purchased often dictating an increased premium outlay to achieve desired product performance. The existing policy has accumulated cash value that can be redeployed into a new policy in order to purchase more death benefit, or reduce ongoing premium costs. 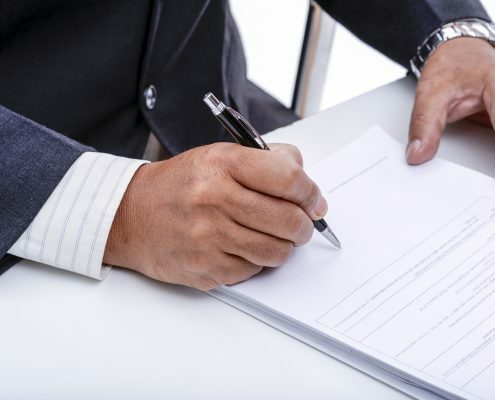 The life insurance industry has experienced a plethora of company mergers, acquisitions and carrier exits along with declines in company financial ratings and/or performance…making review of a life policy asset essential. Improvements in an insured client’s health and today’s more aggressive mortality pricing environment has created opportunities to dramatically reduce current premium outlays. Many clients that have an Irrevocable Life Insurance Trust (ILIT) no longer have a taxable estate due to the large increase of the estate tax exemption. One option is to exchange their existing policy for a new policy that allows them to derive additional benefits in the form of Long Term Care and Chronic Illness Riders while the client is alive, in addition to future death benefit proceeds. To help today’s producer capture the opportunity to expand their business by introducing the topic of life insurance and make the review a part of their due diligence process. 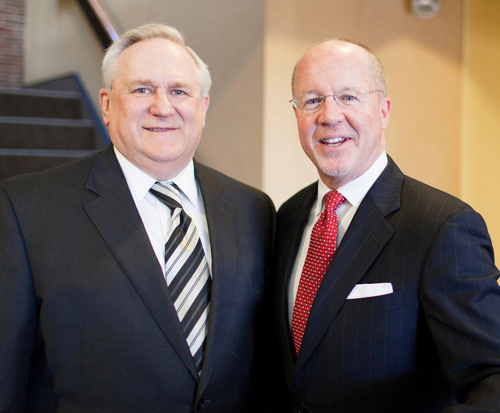 When reviewing a client’s financial position, with a center-of-influence or financial advisor, BSMG is committed to excellence. Today, people are aware of the need for devoting regular and careful attention to their investments. Unfortunately, many do not see an insurance policy as a financial asset that mandates the same oversight. Have the conversation regularly, at least every two to five years, depending on the client and policy. 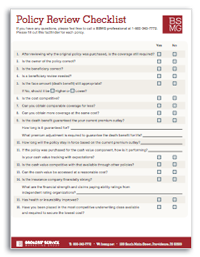 How does BSMG’s life insurance policy audit deliver? A detailed summary of all life insurance policies providing a clear picture of how each policy is projected to perform. A review of the structure of policy ownership, beneficiary designations and premium payment methods to ensure that they’re aligned with current needs. An evaluation of the underwriting assessments on existing life insurance policies and a clinical review to determine possible mortality pricing improvements. A detailed due diligence summary of the financial strength of all applicable insurance companies represented in the existing life insurance policies. An objective and in-depth evaluation as to whether there is a more cost effective and prudent means to meet the client’s current and future financial/risk protection requirements. Contact the Experts at BSMG to Start the Policy Review Process! Evaluating a client’s existing life insurance policy can be time-consuming. That’s why we created this FREE one-page Policy Review Checklist.